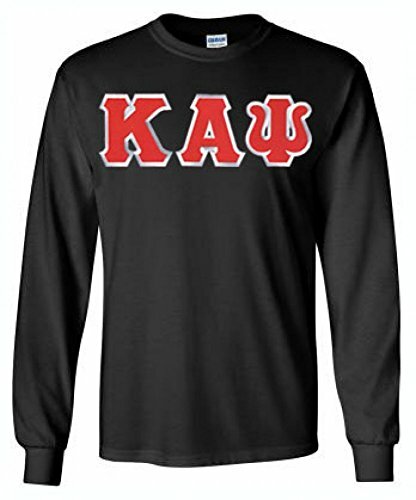 If you're looking for the perfect gift for a group of new initiates who are becoming Kappa brothers soon, check out this Kappa Alpha Psi Lettered Long sleeve. Not only does it look great, it also fits right into your chapter's budget for new member gifts. This popular long-sleeved fraternity shirt looks great with a pair of jeans or cargos. Your KAPsi letters beam out from the chest like they're being illuminated with a light. 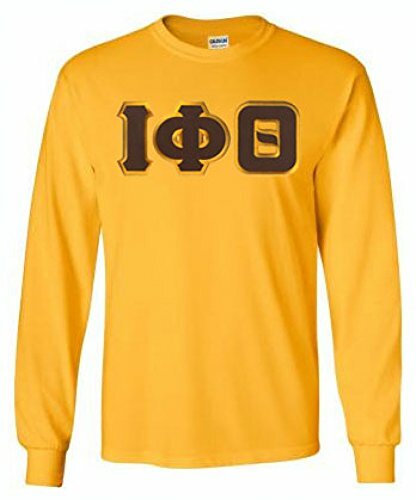 Nothing says I'm about to have some serious fun on campus with my bros like this Iota Phi Theta Lettered Long Sleeve shirt. It's the perfect fraternity shirt to wear when you're heading down the walk with your friends on those cool autumn nights on your way to a party or gathering. This particular fraternity shirt comes in a variety of colors including white, brown and black. You have the option to add a crest to one of the sleeves. Please note this is a "sim-stitch" item, meaning simulated stitching. Letters are heat applied and not sewn on the garment. They do have the same look as a sewn item. As "leaders by choice," it's crucial that you lead by example in everything, including the quality of your Greek paraphernalia! 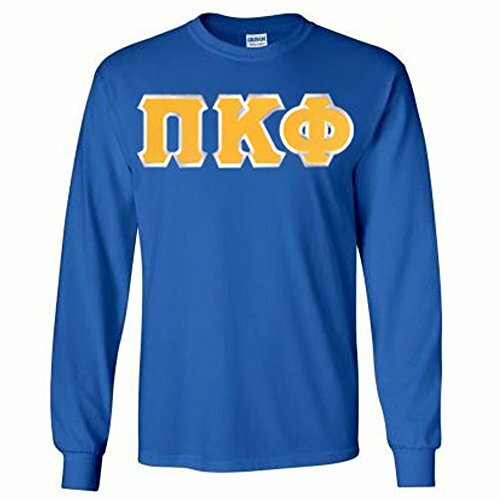 Start with this Pi Kappa Phi Lettered Long sleeve shirt – it looks great with a pair of jeans or cargos. 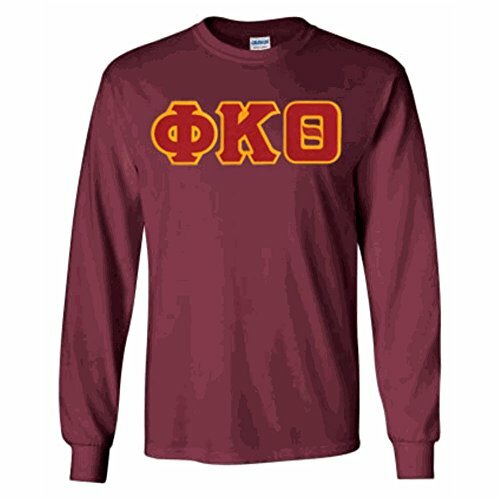 Manufactured with 100% cotton and golden twill Greek letters, this long sleeved fraternity shirt is made to last and last. It comes in white for 20 bucks or you can pick up other colors for a bit more, like black, royal blue and navy blue. Stroll with your brothers in style when you're wearing this Phi Beta Sigma Lettered Long sleeve to upcoming Greek events. It's a white cotton shirt with high quality blue and white twill letters heat applied to the chest. There are more color choices available for a couple of extra dollars per shirt, including Royal Blue, light blue and grey. Wear this PBS long sleeved shirt to your upcoming step shows and picnics to represent for the blue and white family. Please note this is a "sim-stitch" item, meaning simulated stitching. Letters are heat applied and not sewn on the garment. They do have the same look as a sewn item. 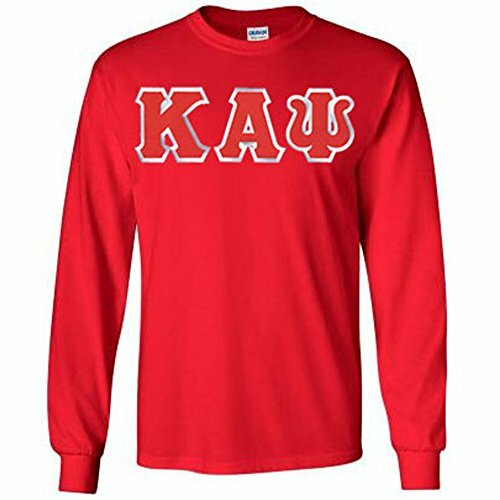 Sure, the Kappa Alpha Psi Fraternity Greek Lettered Long-Sleeve T-Shirt makes a great gift for those new initiates or long-time brothers. But this garment is so good looking, comfortable and affordable you may want to lay in one or two just for yourself. Long sleeves make this a versatile garment that's great for cooler weather. But when the weather warms or you just need to get to work, you can simply roll up those sleeves. This crewneck features Kappa Alpha Psi's Greek letters emblazoned 4 inches tall in fiery red with white borders across the chest, so no one will miss the message. If you're going to fill your wardrobe with Greek gear, make sure it's top quality clothing that will last for years to come. 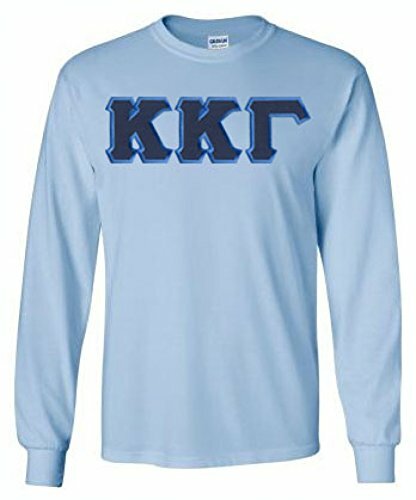 This Kappa Kappa Gamma Lettered Long Sleeve Tee is made of select materials, as is the twill Greek letters running across the front, so it will stand the test of time. 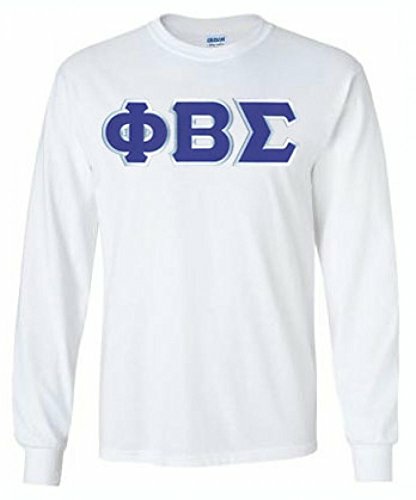 We apply your Greek letters (dark foreground with a light blue background) on a white long-sleeved t-shirt. If you want more shirts in other colors, we also have light blue, grey, black and other shades. These shirts are popular group buys, due to the reasonable price. 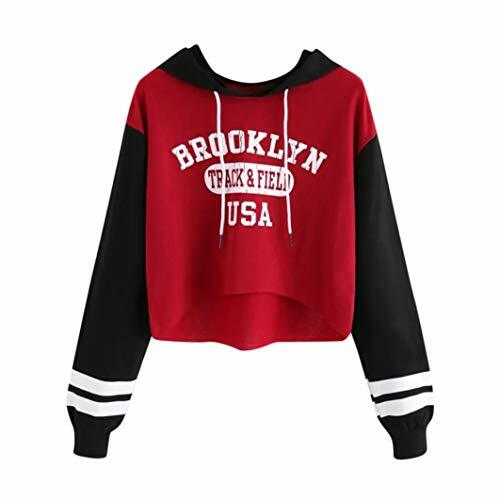 1.It is made of high quality materials,durable enought for your daily wearing2.Very cool to wear ,New Look,New You3.Fashion design can make you more lovely and vitality,4.This lightweight, Sweatshirt is perfect for those carefree days!Product information:Season:FallGender:Women Occasion:Casual,Material:PolyesterPattern Type:LetterStyle:Casual,Sleeve length:FullLength:RegularSihouette:PencilFit:Fits ture to sizeThickness:StandardHow to wash:Hand wash Cold,Hang or Line DryWhat you get:1*Women SweatshirtSizeUSUKEUBustLengthS483496cm/37.8"45cm/17.7"M61036102cm/40.1"46cm/18.1"L81238108cm/42.5"47cm/18.5"XL101440114cm/44.9"48cm/18.9"2XL121642120cm/47.2"49cm/19.3"Size:SUS:4UK:8EU:34Bust:96cm/37.8"Length:45cm/17.7"Size:MUS:6UK:10EU:36Bust:102cm/40.1"Length:46cm/18.1"Size:LUS:8UK:12EU:38Bust:108cm/42.5"Length:47cm/18.5"Size:XLUS:10UK:14EU:40Bust:114cm/44.9"Length:48cm/18.9"Size:2XLUS:12UK:16EU:42Bust:120cm/47.2"Length:49cm/19.3"
You'll probably create plenty of new fraternity memories while wearing this Beta Theta Pi Lettered Long sleeve. It's made of a lightweight cotton material with twill Greek letters sim-stitched (heat applied) to the chest in navy blue and light blue. Get it in white for 20 bucks or other awesome colors like light blue, grey and red for just a couple of dollars more. You can also select the option to have a 3.5" Beta Theta Pi crest added to one of the sleeves. Get what you want - our goal is 100% customer satisfaction. Please note this is a "sim-stitch" item, meaning simulated stitching. Letters are heat applied and not sewn on the garment. They do have the same look as a sewn item. 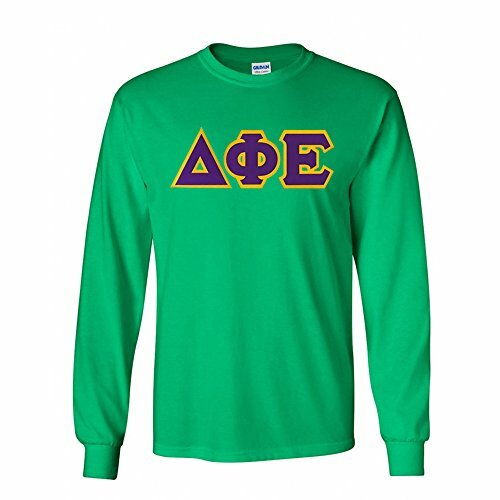 Your arms will thank you when you pull on this Delta Phi Epsilon Lettered Long Sleeve Tee. These shirts consistently top our best sellers list because they are designed for comfortable every day wear and priced just right. If you're headed to the library to finish up a paper (that you procrastinated to the last minute for pull on this sorority long-sleeve shirt, grab your laptop and go. We offer these shirts in white for and other colors, like purple and gold, for a little more. Get one in every shade. Please note this is a "sim-stitch" item, meaning simulated stitching. Letters are heat applied and not sewn on the garment. They do have the same look as a sewn item. At GreekGear we know that organizations like yours often need to order para in quantity for gifts and events. It comes in white, but other colors are also available. This is the type of shirt that you'll be eager to wear whenever you get a chance. It's a great way to show your Greek pride whether you're hanging out on campus on heading to the dining hall for lunch. The white shirt is a popular pick, and if want it in maroon as shown above, black or grey, there is a small added fee for colors. Please note this is a "sim-stitch" item, meaning simulated stitching. Letters are heat applied and not sewn on the garment. They do have the same look as a sewn item! Compare prices on Lettered Long Sleeve at LiveSaler.com – use promo codes and coupons for best offers and deals. We work hard to get you amazing deals and collect all avail hot offers online and represent it in one place for the customers. Now our visitors can leverage benefits of big brands and heavy discounts available for that day and for famous brands. We try to makes comparison shopping easy with Product Reviews, Merchant Ratings, Deal Alerts & Coupons. Find Deals, Compare Prices, Read Reviews & Save Money.